It was really a turbulent year last year (note: 2011). 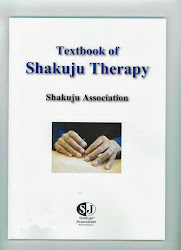 About me, there was the ninth America seminar of Shakuju therapy, I had a seminar in AIMC, Goto gakuen school in the states, and also I had a lecture and workshop in Boston annually. As you remember, we had the Tohoku earthquake on March. After the disaster, one of our members, Ishizaki sensei went to Fukushima as a volunteer of acupuncture treatment. Once I also went to volunteer for the Kobe earthquake, but it is very difficult to make an action. It is a hard task to go just for once, but to continue requires a lot of energy. Requiring energy means that you have to be young to do this. But, the weak point for a young practitioner is that you don't have so much clinical experience. There have always been a big trouble here. Except this, for example, there are political thing, such as issues of the whole acupuncture sphere or related with the group, so acupuncture world contains a complicated problems as well. In such a situation, how each of us can commit to the world? This is a big issue for each of us. Some people might feel that being an acupuncturist is not enough, then become a politician, or others might join the activity as a role of some group. It is good thing to have various people and various ways of commitment. I have been thinking for a long time that one of big issues in the acupuncture sphere is that there is no common "core of acupuncture". Japanese people values ambiguity and diversity, of course this is very good thing, but we need to answer when we are asked what the core of acupuncture therapy is. I have been feeling this urge especially after having American seminars. There are many methodologies, and each treatment method is effective. This means that there are diversity, but they have their own treatment effects as well, there must be something in common there. So, what is the common point among such various methodologies? I have been targeting on grasping what the core thing is. I have been making Shakuju therapy based on such a view. Today, people who are interested in this kind of perspective came to this seminar, I think. It is a two hours seminar from now, but I would like you to feel to make a core inside of you and study. There are roughly three topics in today's seminar. I always talk about the general theory in Chiba seminar. General theory gives you an idea how to look at treatment, people, or sick people, right? I would like you to confirm this each other each time. It is not merely getting used to a methodology to earn your bread, if you become familiar with the ideas of general theory that I'm going to talk with, you will be able to think and act on your own. I would like you to know this, so let us start with the general theory. *This is translated from "Mook Shakuju Therapy" vol.1 (2013), p4-6. This is the summary of Kobayashi sensei's lecture held in Chiba on February, 2012.